These custom gym bags are beautifully handmade, have no minimum order amount and are printed with your favorite photos or designs. Choose from 100% real Italian leather or lightweight canvas and marvel in the expert craftsmanship and stunning print. Each personalized gym bag includes metal stud feet to protect the under carriage from scuffs, 2 zippers for easy opening and 2 internal pockets for storage. Get yourself down to the gym with your very own personalized holdall on your arm. Personalize both sides with your unique designs for a cool way to show off your individual style. They're exceptionally made to order by hand, using your choice of either 100% genuine Italian leather or strong but lightweight canvas. The rolled leather handles provide comfort and support when carrying and the two internal pockets are great for personal items like keys, phone and wallet. Make your own custom gym bags for fitness fanatics and give them an awesome accessory for their workouts. 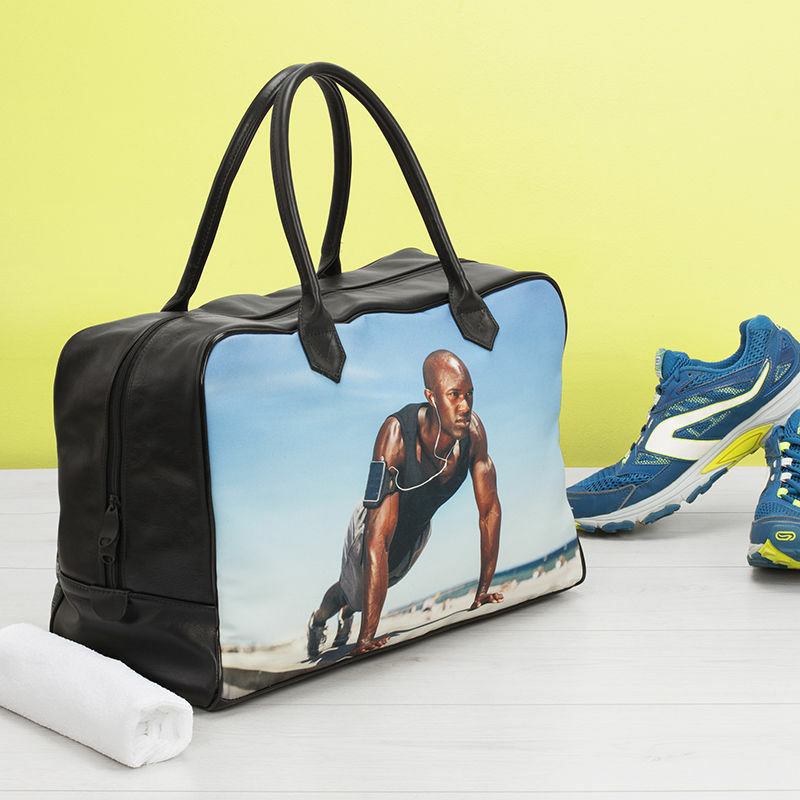 Your personalized gym bag is an exceptional gift for any fitness fanatic. We print your photos onto 8.85oz canvas, using a specialist process that fuses the ink deep into the fabric fibers, ensuring your design is permanent. Hand cut and stitched together with your choice of soft, Italian Nappa leather or the same canvas, our seamstresses make your bag with care and precision, ensuring a beautiful, quality finish. No minimum order amount. To protect your bags undercarriage, we attach silver metal stud feet to the bottom, allowing you to place it on the floor without the risk of scuffs. Rolled leather handles are sewn on either side, providing extra comfort when you're on the move. Care: Made from strong, tough, durable materials and the best components, your bag is extremely hard wearing. The surface can be wiped clean with a damp cloth only. We use approximately 0.39" of the fabric edges to sew the hem, so please take into account the bleed area and that important details of your design are placed outside this area. Also, it's important when you design your own gym bag to consider the position of the rolled leather handles, making sure that they won't cover important elements of your photo. The canvas fabric has amazing print reproduction, so colors and details come through really well. As each side is designed individually, why not print totally contrasting images so you can switch up your style day to day? To keep yourself motivated, design a holdall that features an inspiring quote from one of your favorite athletes, or a photo that spurs you on to keep training. Whenever you feel like skipping the gym, your bag will provide an encouraging reminder that it's important to go. A photo collage is a great idea if you have a collection of photos that you can't choose between. Simply upload a variety of photos, select all and then choose from several montage styles, including a chic heart shape. To get two custom gym bags in one, you could print a message on the other side, a single image or a totally different concept altogether. If you play a certain sport, this is the ultimate place to print photos from your tournaments and games. Also featuring your team name and other bits of information, this can be your staple bag for practice sessions, competitions etc as it promotes your team and logo.